At this moment 30 years ago, Italy and Bulgaria players were walking onto the pitch at Estadio Azteca in Mexico City for the opening game of Mexico 86. The game was broadcast live on the BBC. 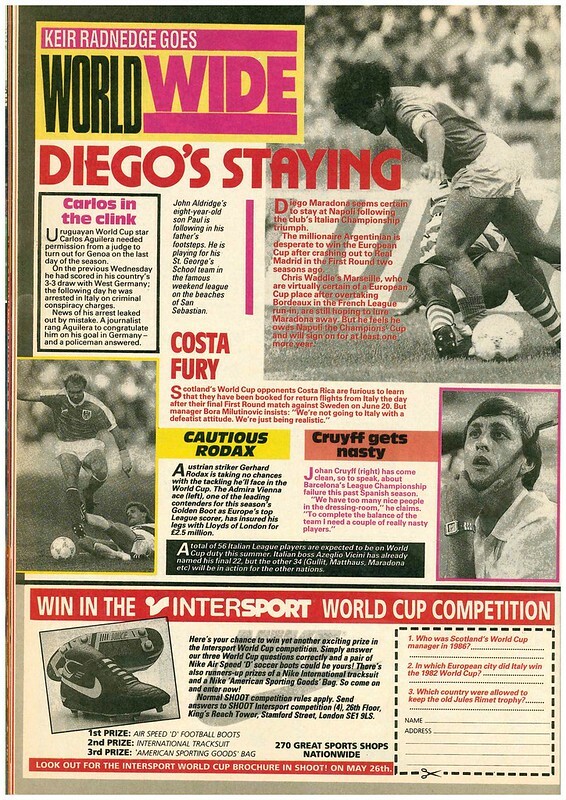 As people sat in front of their TVs awaiting the month of football to come, it’s possible they may have been reading Shoot’s 1986 World Cup Preview guide, costing 75p. 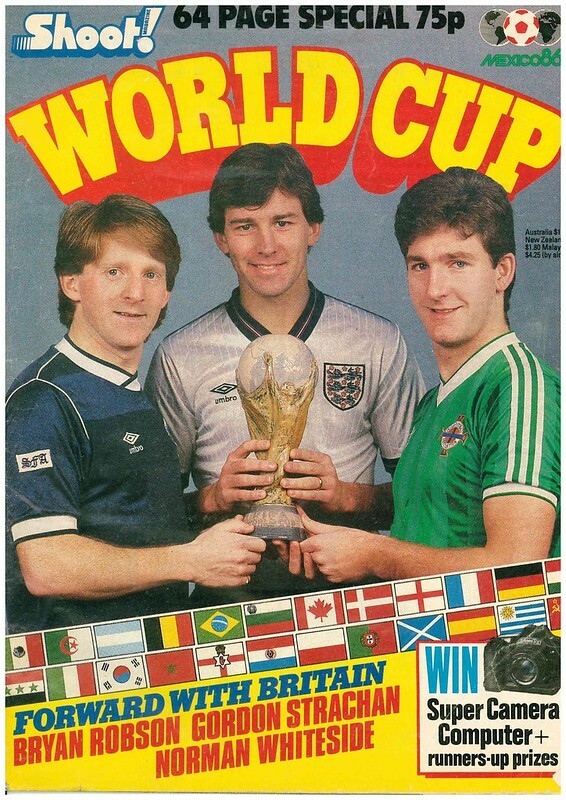 With three UK teams in the finals (something that wouldn’t happen again until Euro 2016), Shoot capitalised on this by having a player from Scotland (Gordon Strachan), England (Bryan Robson) and Northern Ireland (Norman Whiteside) all holding the World Cup trophy. 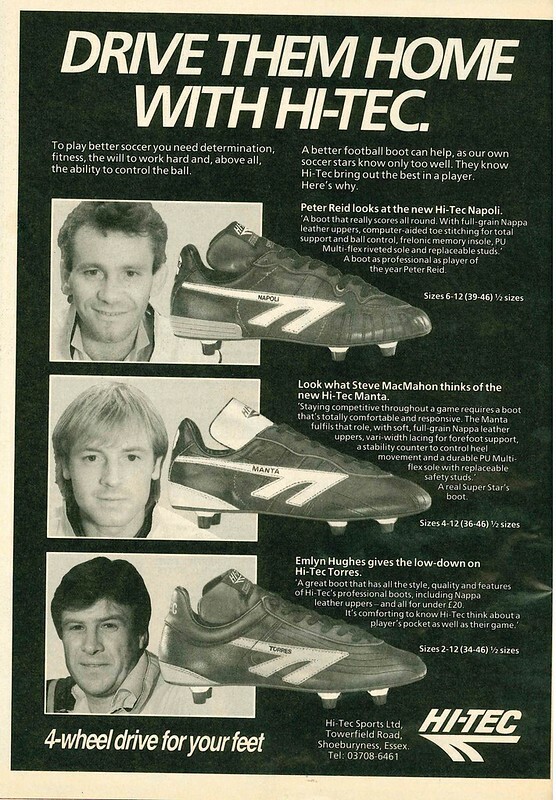 All three were playing for the same club in 1986, so it was obviously convenient for them to arrange the photoshoot. As you open the magazine, there is a double page editorial saying “Go get em lads”, wishing the three UK teams good luck. 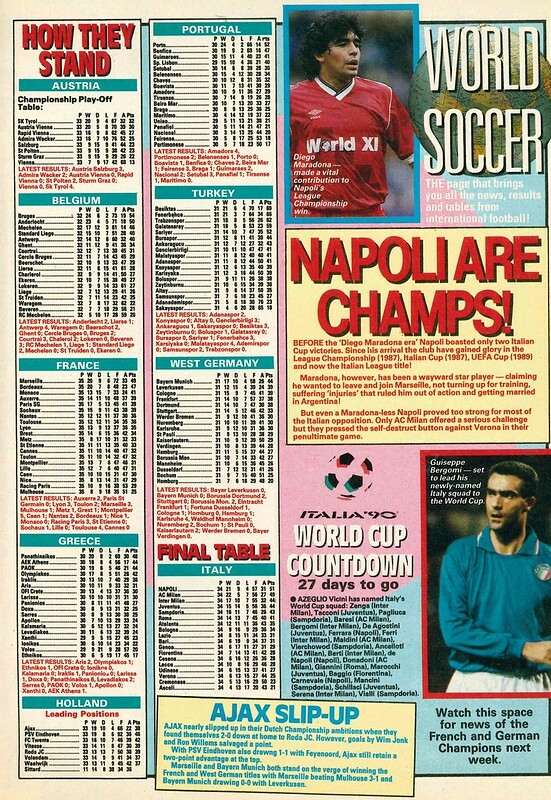 There is then a double page TV guide, but it only covers the opening match, and the home nations group games. 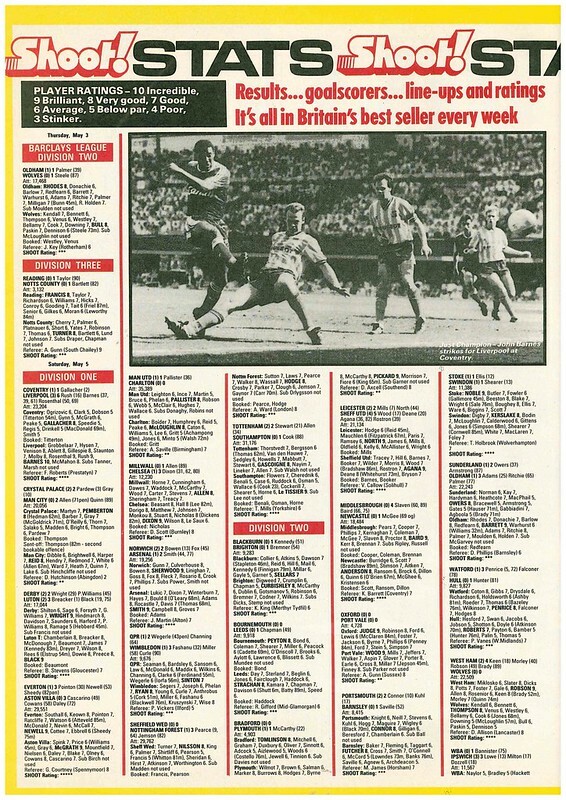 For the record, Northern Ireland and Scotland had two live games on ITV and one on the BBC, while England had two games on the BBC and one on ITV. 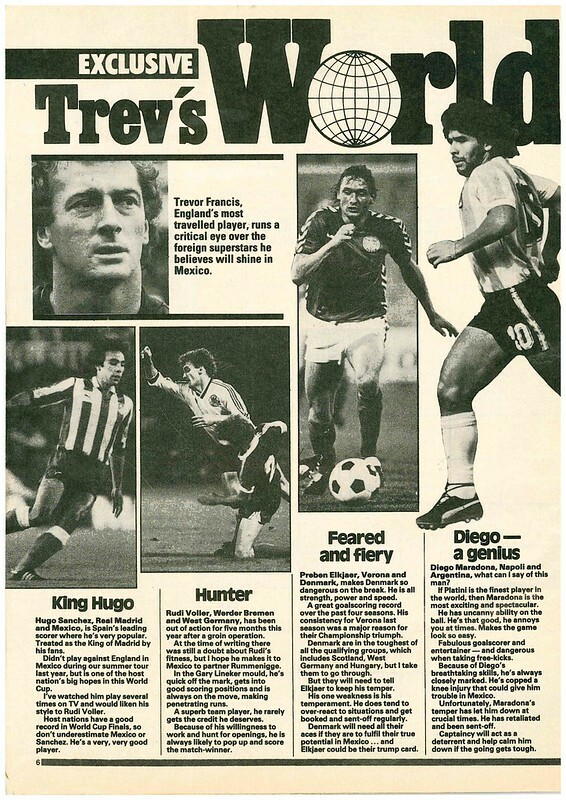 Trevor Francis gets four pages to write about who he thinks will be the stars in Mexico, predicting big things from Hugo Sanchez, Rudi Voeller, Preben Elkjaer, Diego Maradona, Michel Platini, Rinat Dasaev, Zico and Karl-Heinz Rummenigge, Enzo Scifo, Daniel Passarella, Antonio Cabrini, Zibi Boniek and Michael Laudrup. 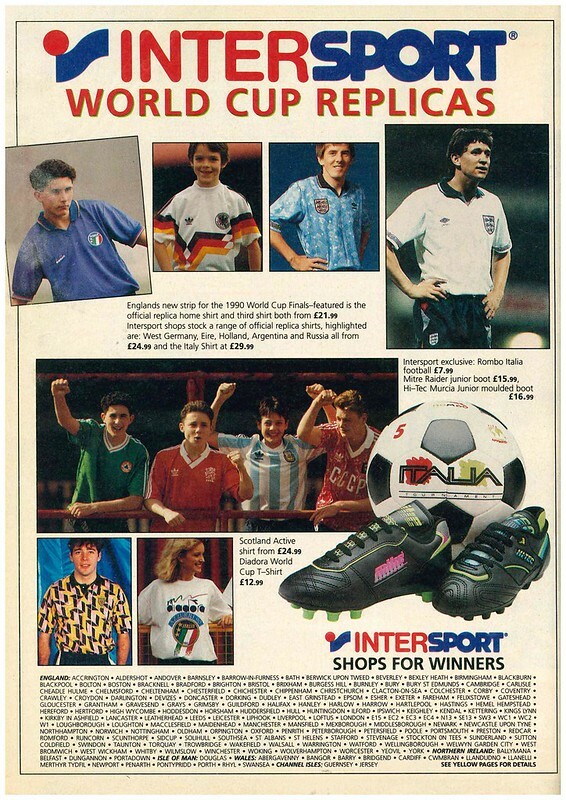 Quite a lot of those players were based in Serie A, where Francis was playing his club football. Channon also commented that he was recently in Belfast to play in a testimonial game for George Dunlop. Mal Donaghy gets a lot of praise from Channon, stating he would walk into England and Scotland’s teams, comparing him to Bobby Moore. For the whole tournament, he expected Argentina to beat Brazil in the final. 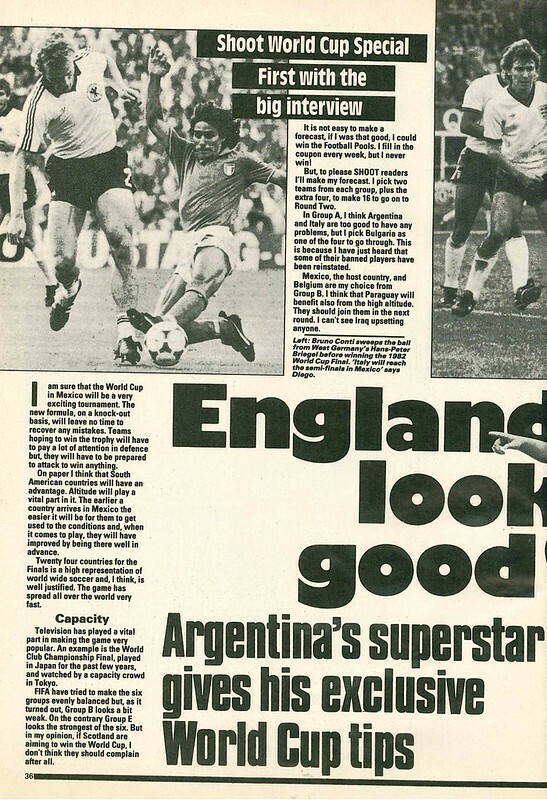 Tony Roche gets a double page spread to assess the rest of the European teams, stating that Denmark could take the competition by storm, comparing them to Holland’s team of the 70s. There is a full page round up of the results and tables from the European groups. Peter Reid gets interviewed with the headline “ON YER BIKE JOAN COLLINS”. In case you’re wondering why, England will be warming up in America, staying in a hotel in Denver which is used to film scenes for the TV show Dynasty. 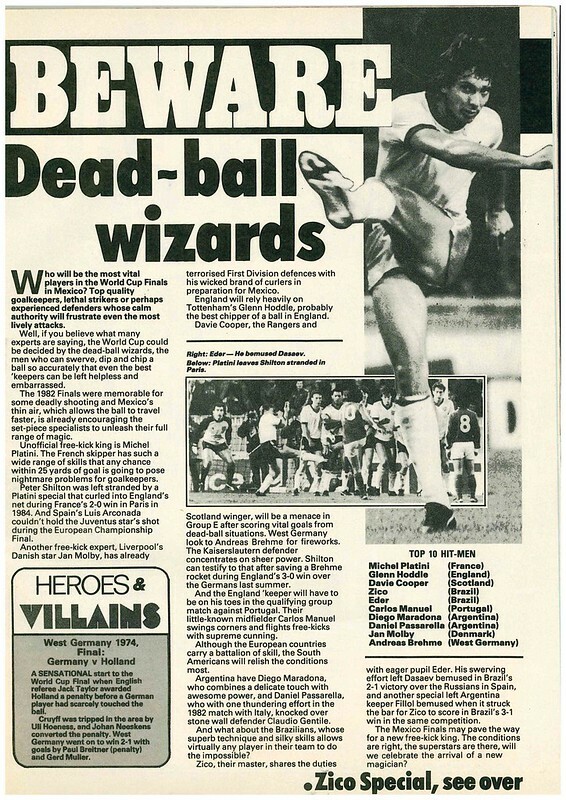 Reid comments on the progress in his career between World Cups, having just avoided relegation to the Third Division with Bolton in 1982, he was now challenging for trophies with Everton. 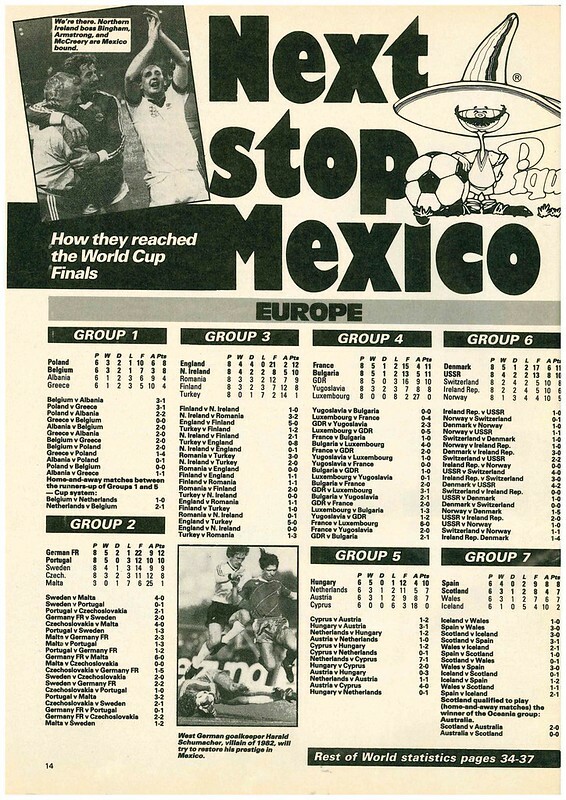 Shoot canvassed journalists from around the world for their opinion, and the consensus was that Brazil would repeat their success in Mexico they had in 1970. 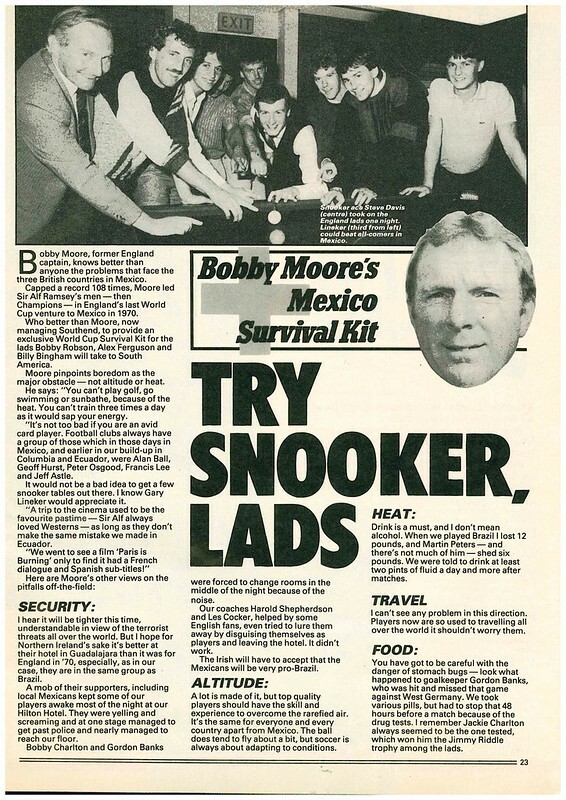 Bobby Moore writes about his experiences at the 1970 World Cup, advising the players that playing Snooker will be a good way to relieve the boredom in the hotel room. Charlie Nicholas gets four pages to write about his Scotland team-mates, where he reveals he shares a room with Steve Nicol. They are good mates, but Nicholas doesn’t share Nicol’s love of Status Quo. 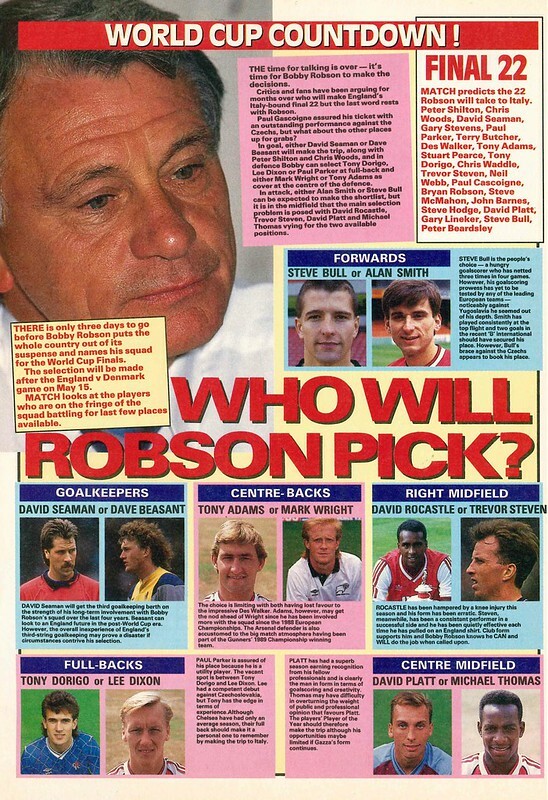 Ferguson and Robson predict Brazil will win the trophy, while Bingham shies away from predicting a winner. 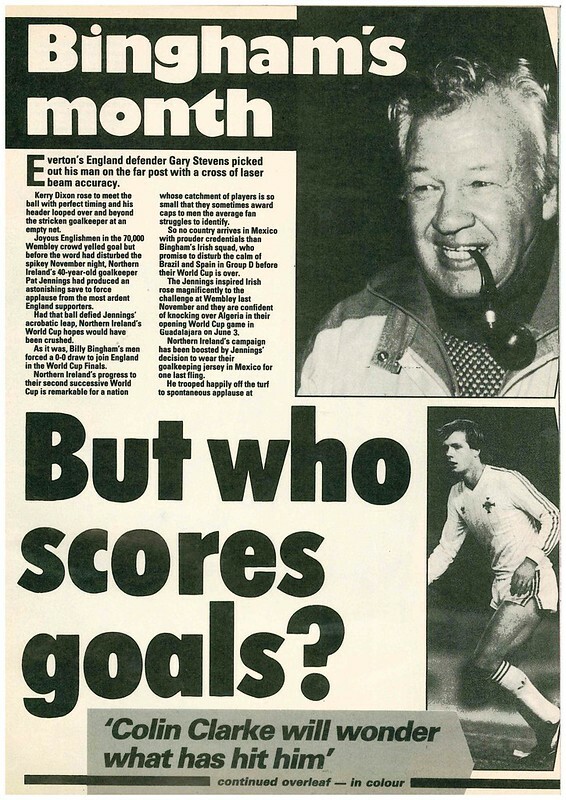 Bryan Robson writes a two page article where he predicts England will reach the Semi-Finals, and that Gary Lineker will be England’s biggest star in Mexico, comparing him to Jimmy Greaves. 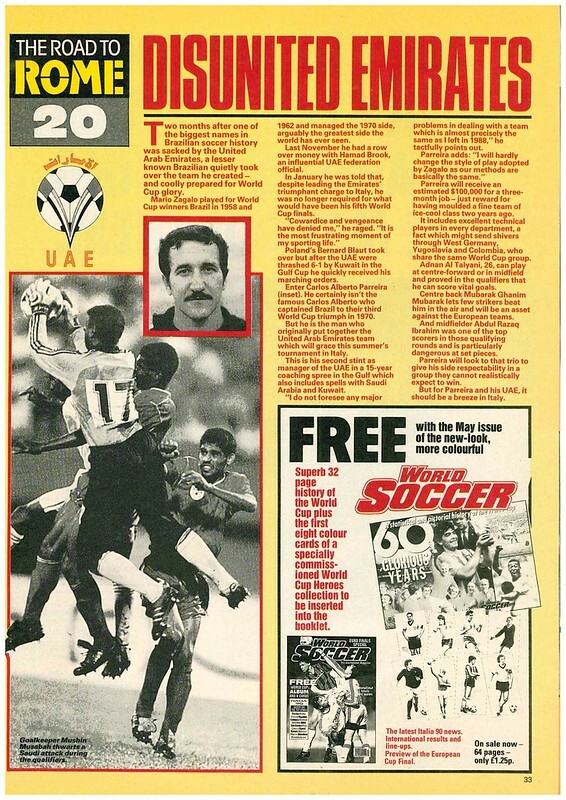 There are two pages then dedicated to the South American challenge, written by Tony Roche. Shoot has bagged an interview with Diego Maradona, who says England look good, Northern Ireland have a chance of reaching the knock-out stage, while Scotland are in the toughest group. He didn’t predict Morocco to upset anyone. The main question asked in Northern Ireland’s preview is where the goals will come from. Billy Bingham has a lot of praise for Norman Whiteside, predicting him to be a regular Northern Ireland player for the next decade. Jimmy Greaves has two pages of letters, where a Notts County fan predicts Algeria to win because of Rachid Harkouk, to which Greaves sarcastically responds. There is a full page dedicate to free-kick experts, listing the best players with this skill, including Platini, Hoddle, Cooper and Molby. 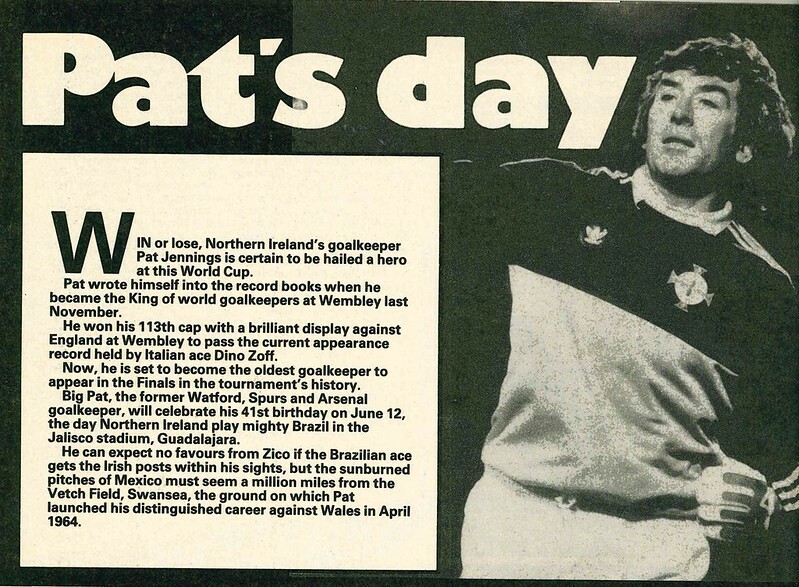 As well as looking forward, Shoot also looks back at England, Scotland and Northern Ireland’s World Cup history. There are two pages dedicated to Jock Stein, who was Scotland manager during the qualifying campaign until his death after the game against Wales in September 1985, with tributes from Alex Ferguson and Billy McNeill. 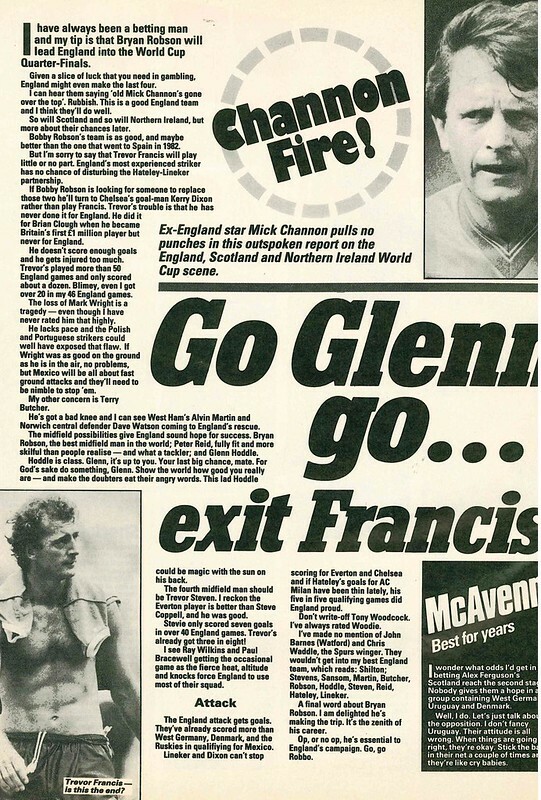 There is a competition where you can win a Sinclair ZX Spectrum and Ray Clemence World Cup video game. The preview ends with an infographic of all the team’s kits. 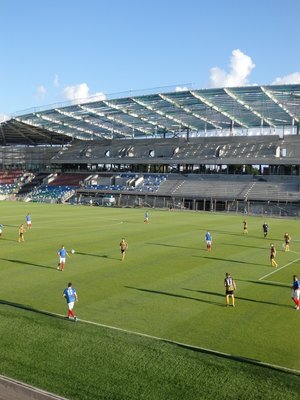 After League Of Ireland and UEFA Cup football during June and July, the domestic season began for me in August, when Linfield welcomed Ballymena United to Windsor Park on the opening day of the season. Four days later, I visited Taylor’s Avenue for the first time, as Linfield travelled to newly promoted Carrick Rangers. To round off a busy week, it was back to Windsor Park to see Linfield take on Dungannon Swifts. The following weekend, I was in Scotland for my annual trip to the Edinburgh Festival, and made the most of it by taking in matches at Hearts, Rangers and Dunfermline. Upon my return from Scotland, it was back to Windsor Park, my third time this month, to see Linfield take on Portadown, and get a win that continued their perfect start to the season. Once a year, I like to do a day trip to Dublin, and while there, take in a League Of Ireland game. Due to an international match being played on the League Of Ireland’s traditional Friday night slot, this round of games were moved to a Sunday afternoon, and on a Bank Holiday Weekend, made this round a no brainer for me. I had my choice of matches. Shamrock Rovers were at home to Finn Harps. In the First Division, Shelbourne were at home to Limerick, while Cabinteely were at home to Drogheda United. Shelbourne was tempting, but Tolka Park is relatively close to Croke Park, and with Springsteen in town, getting there and back was potentially problematic. I’ve never been to Cabinteely, one of two senior football grounds in Dublin I haven’t been to (the other being UCD’s ground) and this was tempting. Unfortunately, I was only doing a day trip and didn’t have time to waste trying to find the ground. Part of the reason for only doing a day trip, especially being off work on the Monday, was that I faffed about for so long booking a hotel, Springsteen announced a gig that day, and the prices soon drove up. This match at Dalymount had it’s own special appeal to me. It had been six years since my last visit there, and it might be the last chance I have to visit there in it’s current form ahead of a proposed redevelopment, assuming they don’t take as long faffing about with stadium redevelopments in Republic Of Ireland as they do in Northern Ireland. My only two visits to Dalymount Park have seen wins for Bohs, and their fans were hoping it would be a hat-trick for me, with their side 10th in a 12 team league, just 4 points clear of the relegation zone, against a St Patrick’s Athletic side not where they wanted to be, on the wrong side of a 4 point gap, as they chase European football. Bohs went straight on the attack, with the confidence of a team higher up the league, and found themselves 1-0 up after 2 minutes with the ball was pulled back to Roberto Lopes, who scored from close range. The tannoy blasted out Gold by Spandau Ballet, with the fans singing along, but changing “Gold” to “Bohs”. It was a sound we would hear quite a lot of times through the afternoon. Just 2 minutes later, St Pat’s gifted the ball to Ishmail Akinade, who made it 2-0. Bohs fans were equally as stunned as the St Pat’s fans, and they were loving it. St Pat’s were a mess in defence, and were lucky to get a goal kick when their keeper was charged down trying to clear the ball away. Given the start Bohs had made, it was surprising that the ball didn’t end up in the net. The ball was in the net soon after, when Jake Kelly was played through and finished. It was too easy for Bohs. St Pat’s actually reacted well to going 3-0 down. They had chances and pressure, usually blocked on the line, or just not getting the bounce. At both ends of the pitch, everything was going Bohs way. If you’re 3-0 up, it can’t be all luck, but bad finishing by Bohs and better by Pat’s would have seen the match narrative dramatically changed, that Pat’s had rode their luck earlier on to get a 1-0 lead without playing well. Just as looked like St Pat’s might be getting a goal back to give them some hope in the second-half, Bohs made it 4-0 when Jake Kelly scored from close range. The factfile of St Patrick’s Athletic in the match programme, listed the club’s record defeat as a 7-0 defeat at Dalymount Park in 1974. On the basis of the half just witnessed, that being equalled or beaten looked like a realistic possibility. As the second-half started, it was Bohs who had the best chance when Akinade fired wide after being gifted possession. St Pat’s had possession, but never looked like scoring. That was, until Ian Bermingham headed home with just over 10 minutes to go. It was celebrated like a consolation goal rather than the beginning of a dramatic comeback. If St Pat’s were hoping to launch a late rally, that hope was soon extinguished, when Sean Hoare was sent-off for a professional foul, coming about after Pat’s had again gifted away possession in their defensive third. From the resulting penalty, Kurtis Byrne made it 5-1. St Pat’s were able to avoid conceding any more with 10 men on the pitch, the damage was done in the first-half, specifically, the opening 12 minutes. As the final whistle blew, Bohs fans naturally celebrated the win, cheering their team off the pitch. For me, that was the end of my 2015-2016 season. Took a day trip to Dublin, making the most of an extended Bank holiday Weekend. While, I was there, I took the opportunity to get some Street Art photos. I’ve been to Dublin many times before and know my way around the City Centre, and know where a lot of the Street Art is. One thing I wanted to was see the David Bowie mural in Francis Street, but I didn’t get a chance to, I was on a tight schedule. I did get to see a cafe in Newmarket having the iconic lightning bolt painted on their door as a tribute to him. I wanted to get some pictures of the Tivoli Theatre Car Park, which is covered in Wall Art, but it was closed the two times I was over there. There is a mixture of old and new art, naturally, I just left the old ones. No point photographing what i’ve already photographed. When I was in Dublin, I headed to a football match at Dalymount Park, which has some excellent pieces of Wall Aart as you approach the ground, so I snapped some of them. As there is a proposed redevelopment of Dalymount Park in the coming years, I was glad to get these as there is a possibility they could be lost or destroyed when the development takes place. I hadn’t been there on any of my recent visits to Dublin, so it was good to get this. After the game, I headed back into the City Centre, and got some shots from Temple Bar. Until my next visit to Dublin, enjoy. There was only two weeks between the end of 2014-2015 and the start of 2015-2016. It was a horrible two weeks. This season, like last season, began in Bray. I was on a day trip to Dublin in late June, so I took advantage of the teatime kick-off and close location. It was a bottom of the table clash, and it was unsurprisingly tense, as Bray managed to dig out a 1-0 win. Towards the end of the following week, was my first Linfield match of the season, a UEFA Cup tie against NSI Runavik. I’d have to wait three weeks for my next Linfield match, the 2nd leg of the 2nd Round tie against Spartak Trnava, which Linfield lost 3-1, and 5-2 on aggregate. Just 16 days before their opening Euro 2016 game against Poland, Northern Ireland warmed up with a friendly at home to Belarus, on a night that would see the air in South Belfast filled with smoke, and it was only partly caused by Will Grigg. It was the first meeting between the two sides, meaning that Northern Ireland need games against Andorra, Bosnia and Herzegovina, Croatia, Gibraltar, Kazakhstan, Kosovo and Macedonia to have played against every other country that is a member of UEFA. Northern Ireland were straight on the attack, with Kyle Lafferty putting the Belarus keeper under pressure from a cross in the first minute. A free-kick was awarded for that incident, but Lafferty’s next involvement was to put the ball in the Belarus net when poor defending from Belarus allowed Kyle Lafferty the opportunity to toepoke home from close ranger to make it 1-0. It was his 17th international goal in 50 appearances, only the 19 behind record holder David Healy. The game died out a bit after that bright start, with Belarus almost equalising via a Jonny Evans own goal when a cross hit him and looped over, but it was enough to cause Roy Carroll concern. That was the best that Belarus offered. Any time they got into Northern Ireland’s final third, the danger was easily snuffed out, and any through balls were easily shepherded out for a goal kick. As the half neared it’s end, Belarus gave Northern Ireland another gift when their keeper punched a cross straight to Conor Washington, who headed home from a few yards out for his second goal at Windsor Park in two appearances. At the start of the second-half, there were the inevitible substitutions, including Alan Mannus replacing Roy Carroll, Linfield past for Linfield future. Despite the changes in personnel, the second-half continued to be dominated by Northern Ireland. Will Grigg, the man on fire, almost scored with his one of his first touches, a header from a free-kick, after coming off the bench. Also coming off the bench, was Aaron Hughes, winning his 99th cap, meaning he is on track to win his 100th cap for Northern Ireland next weekend against Slovakia, the country he won his first cap against, way back in the last century. The crowd got what they all wanted to see, when The Man On Fire scored after another gift from the Belarus keeper, who punched a cross straight to him, leaving him only needing to put the ball into the empty net. And that, was the end of the action, as Northern Ireland recorded an easy win against poor opposition. For me, that is almost my 2015-2016 season over. I’m planning to do a day trip to Dublin tomorrow, so might take in a League Of Ireland game while i’m there. In just over two weeks, my 2016-2017 season will start, watching Northern Ireland take on Poland in Nice, and then a few days after that, the fixtures for English and Scottish football get published. I’m not sure if i’m going to Edinburgh this August, so might not get to any Scottish games. In terms of Manchester United, i’m at a wedding in the North West of England in September, so hope for a home Sunday game that weekend, while i’ll be hoping the UEFA Cup draw is kind enough to offer the possibility of Thursday and Sunday back to back home games, which I might do. That can wait though, it’s all about Northern Ireland v Poland. It can’t come soon enough. We’ve been waiting thirty years for this, another two weeks isn’t going to hurt. Not long to go now until kick-off at Wembley. 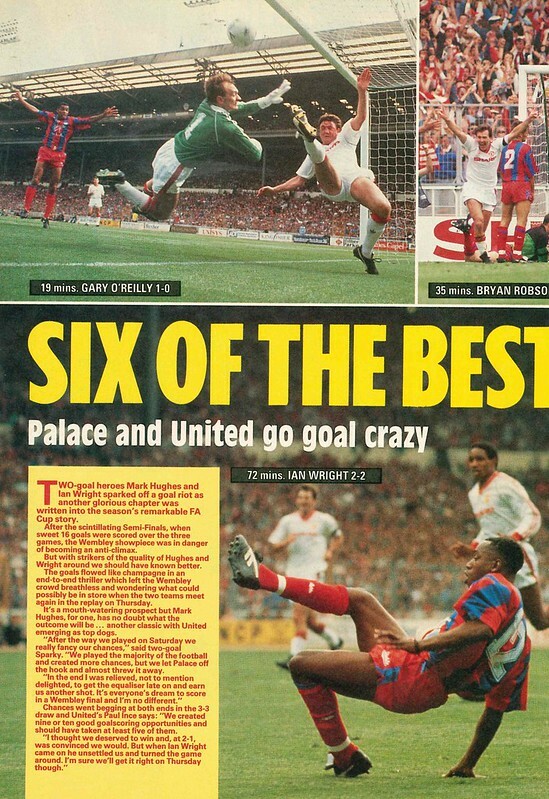 Back in 1990, Manchester United and Crystal Palace drew 3-3, meaning a replay was required to decide who won the cup. Printing deadlines meant Shoot could only cover the original game in this edition. 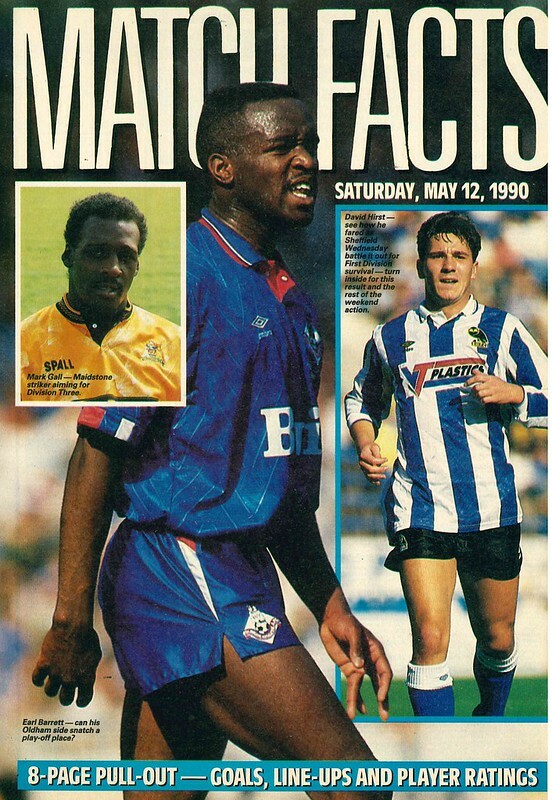 That match at Wembley got four pages of coverage, with a lot going to wether Ian Wright, who came off the bench to score twice, would be picked in the replay. In Scotland, they didn’t go to a replay, as they used a penalty shoot-out to decide it. Aberdeen beat Celtic 9-8 in the first Scottish Cup Final decided by penalties, but Aberdeen manager Alex Smith criticising the use of a penalty shoot-out instead of a replay, even though his team won. Luton Town’s great escape against relegation gets covered with an interview with Kingsley Black, who announces he wants to stay at Luton despite interest from Nottingham Forest and Liverpool. 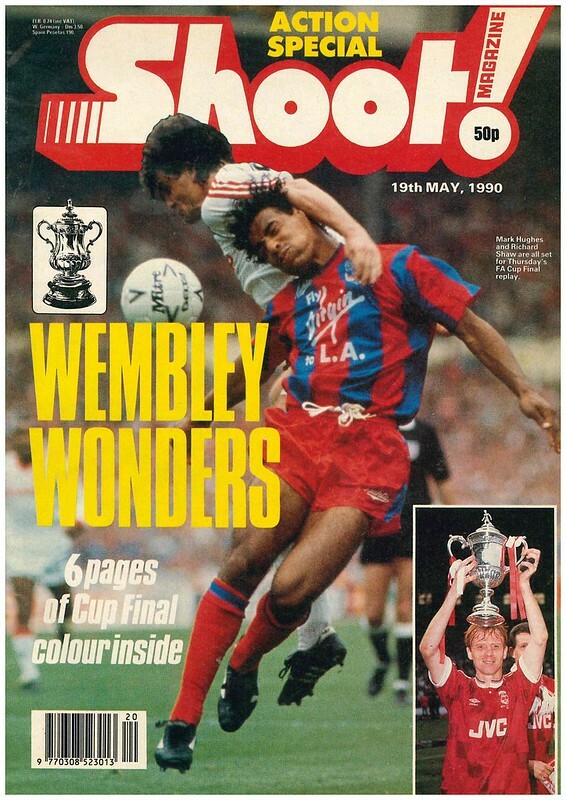 Shoot previews the European Cup Final, which Ruud Gullit is desperate to play in after a season blighted by injuries. He did play in a match which finished 1-0 to AC Milan, just as predicted by Shoot. 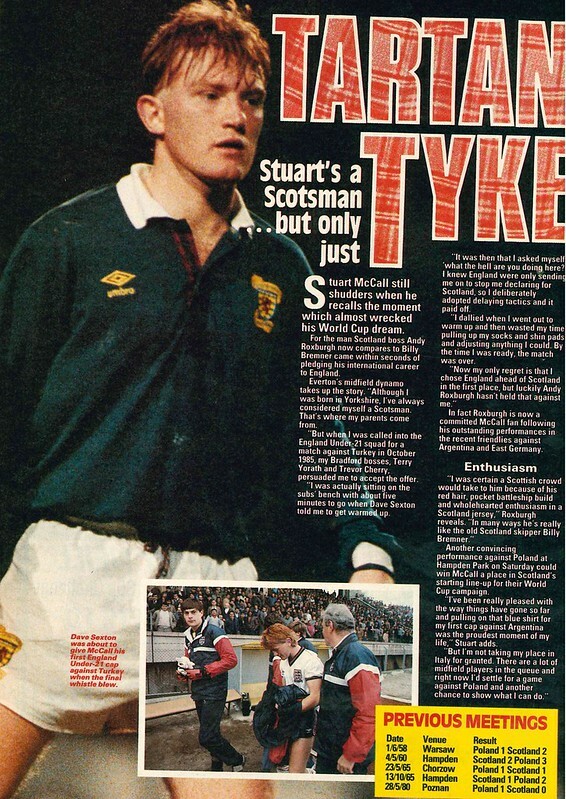 With the World Cup coming up, Scotland face Poland in a friendly, with Shoot interviewing Stuart McCall, as he reflected on the moment he almost made a substitute appearance for England in an Under 21 international. Leeds United are promoted back to the top flight of English football after an eight year absence, but Shoot says they should be kicked out of football altogether after crowd trouble at their final game at Bournemouth. 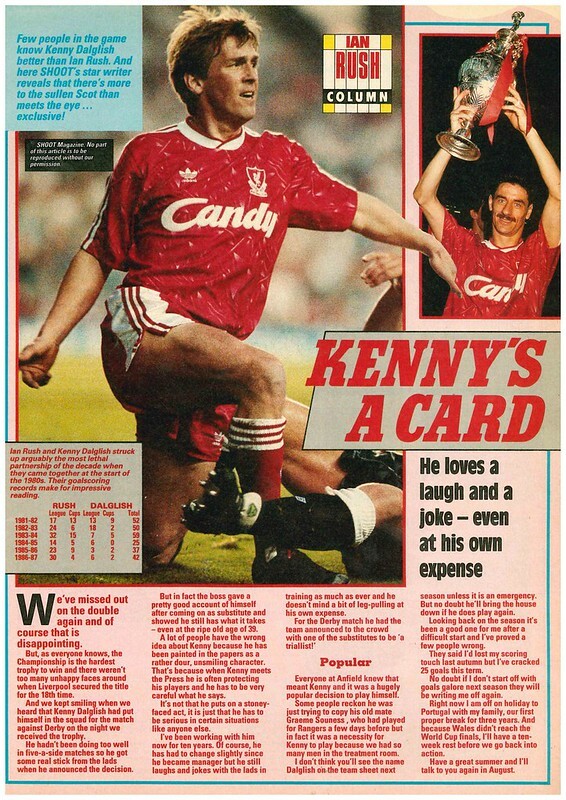 Ian Rush uses his column to pay tribute to Liverpool manager Kenny Dalglish, who has just retired as a player, making a final appearance in the game against Derby. There is a double page interview with Niall Quinn, who recently left Arsenal for Manchester City in a bid to get first-team football to ensure his place in the Republic of Ireland’s World Cup squad. In foreign news, Diego Maradona intends to stay at Napoli in an attempt to win the European Cup. 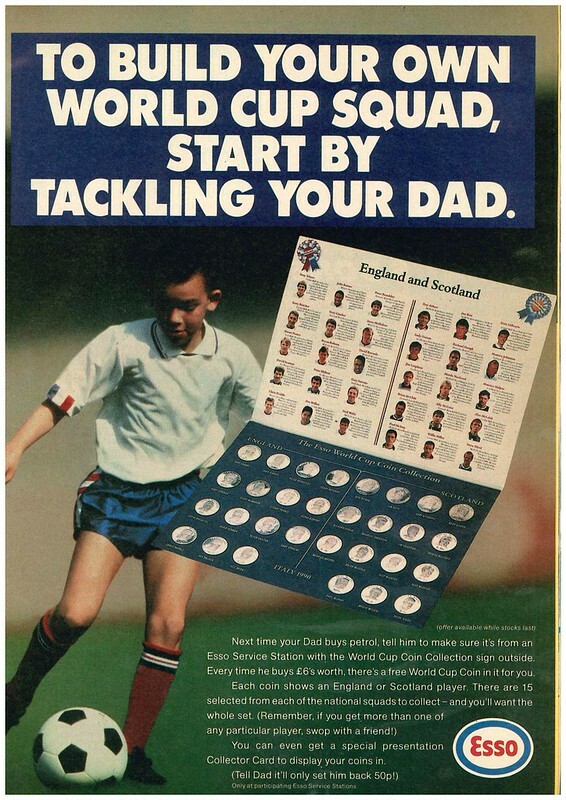 In ads, there was an advert for Esso’s World Cup coins of the England and Scotland teams. Transfer rumours see Sampdoria want to sign Steve McMahon, Celtic want to sign Brian McClair, and Liverpool want to sign Wynton Rufer. Previews of the forthcoming World Cup continue with United Arab Emirates, a squad who is very much disunited due to rows over money. Dundee’s relegation from Scotland’s top flight was covered with an interview with Billy Dodds, who says he intends to stay at Dens Park. There is another Wembley Cup Final this week, with Third Division champions Bristol Rovers taking on Tranmere Rovers in the Leyland Daf Cup Final. Rovers were currently exiled at Twerton Park in Bath, with defender Geoff Twentyman saying the club will be the poor relations in the city until they get a new ground. Tranmere won the match 2-1. Later today, Alan Pardew will lead out Crystal Palace for the FA Cup Final. In 1990, he was playing for Crystal Palace, appearing on the cover of Match with current Stoke City manager Mark Hughes, then a Manchester United player, with the FA Cup sandwiched inbetween them. 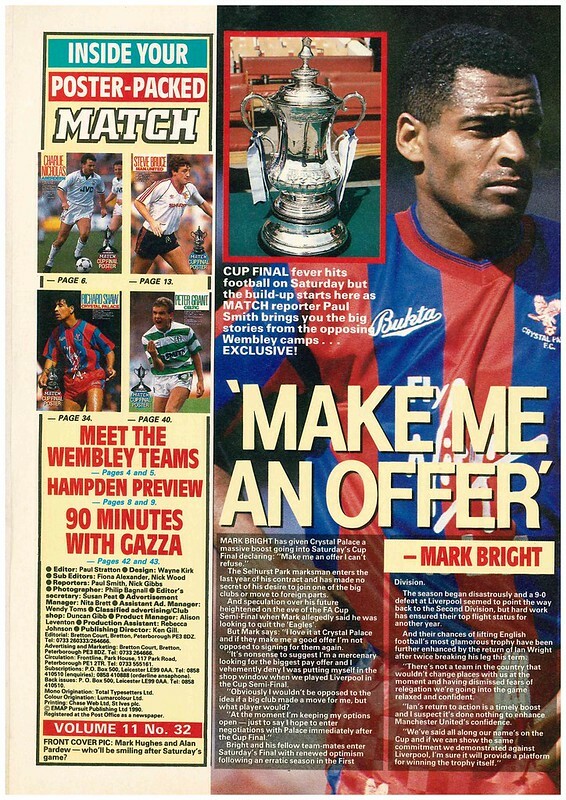 As you open the magazine, Mark Bright is interviewed, urging Crystal Palace to make him a contract offer he can’t refuse, amid speculation over his future. 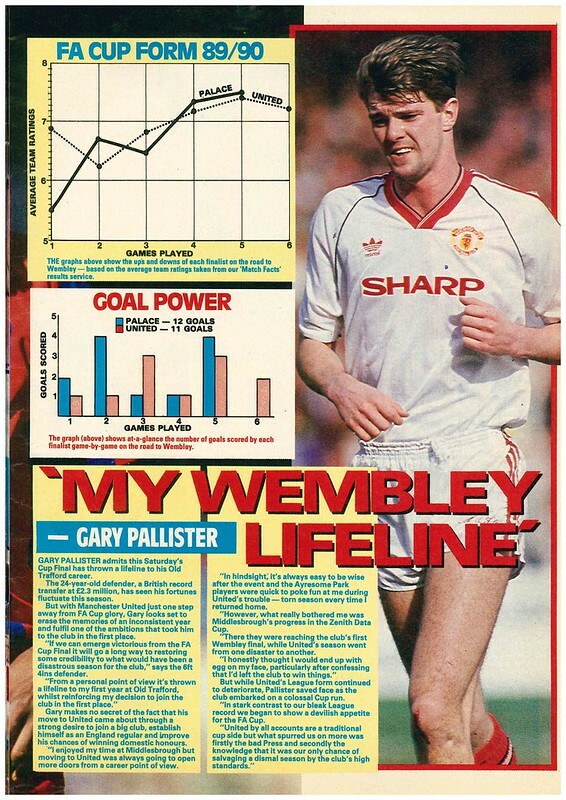 Across the page, Gary Pallister is interviewed, stating the the FA Cup offers a lifeline to a disappointing season for both him and United. 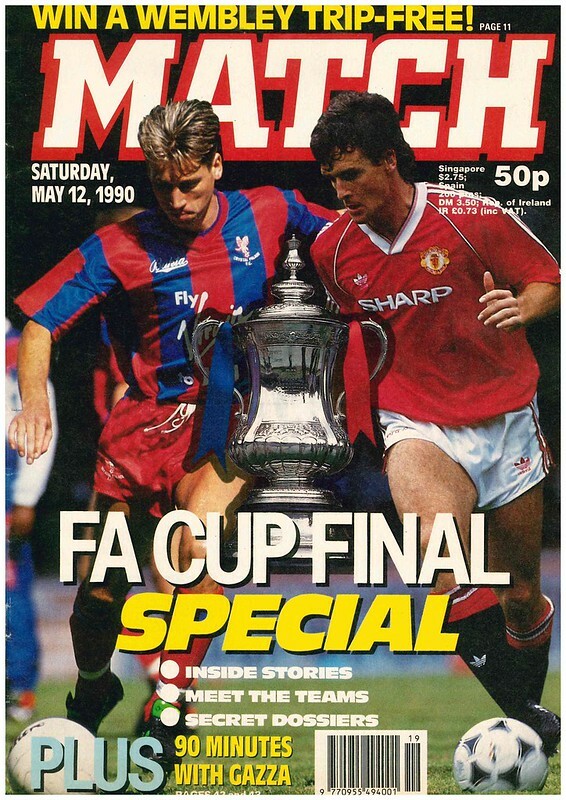 In traditional cup final fashion, the teams get profiled by a team-mate, Gary O’Reilly for Palace and Mike Phelan for United. 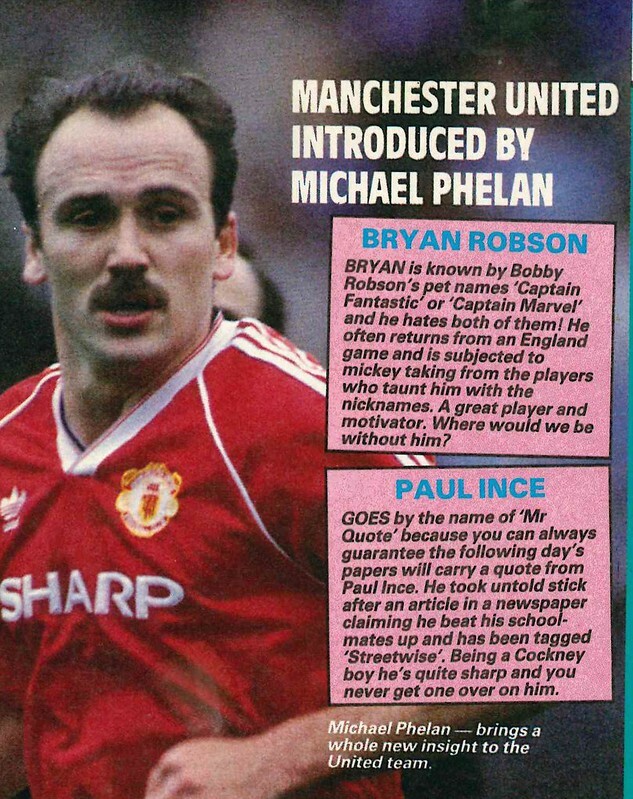 Phelan reveals that Steve Bruce is known as “Empty head” due to knowing a lot of useless facts, and Paul Ince is known as “Mr Quote” due to his love of speaking to the press. In news, Ronnie Rosenthal states he won’t be returning to Standard Liege for the following season, with Liverpool, where he on loan, being his preferred destination. It’s also Cup Final Day in Scotland, where Celtic face Aberdeen, and this gets a double page profile. 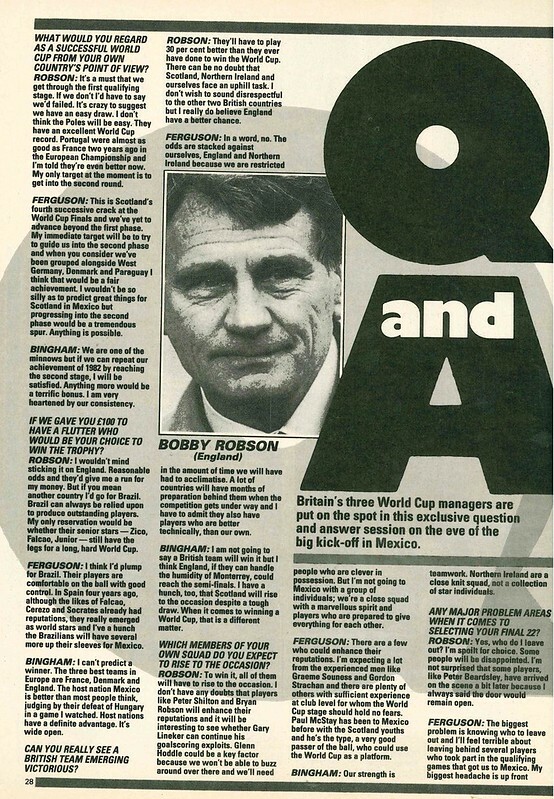 With the World Cup in Italy approaching, Match looks at those players with ambitions of being on the plane, and the choices Bobby Robson has to make. 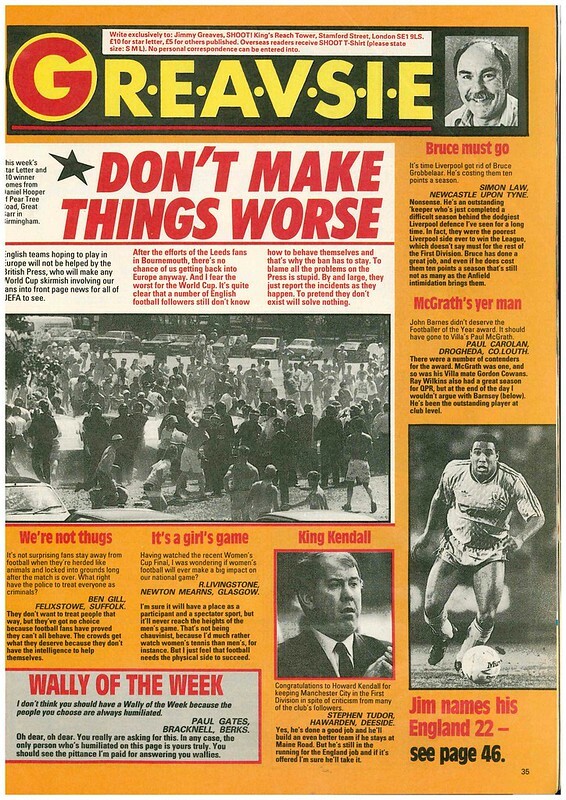 Ally McCoist gets a profile, where he reveals a fondness for Brooke Shields, a fear of Spiders, and that his favourite thing about Match is photos of Ally McCoist. In Match Facts, 18 year old Mark Bosnich made what Match described as a “reasonable” debut for Manchester United in a 0-0 draw with Wimbledon. In their foreign round-up, Napoli win Serie A, but their star player Diego Maradona wants to leave and join Marseille. As part of their World Cup preview, South Korea get a double page profile. 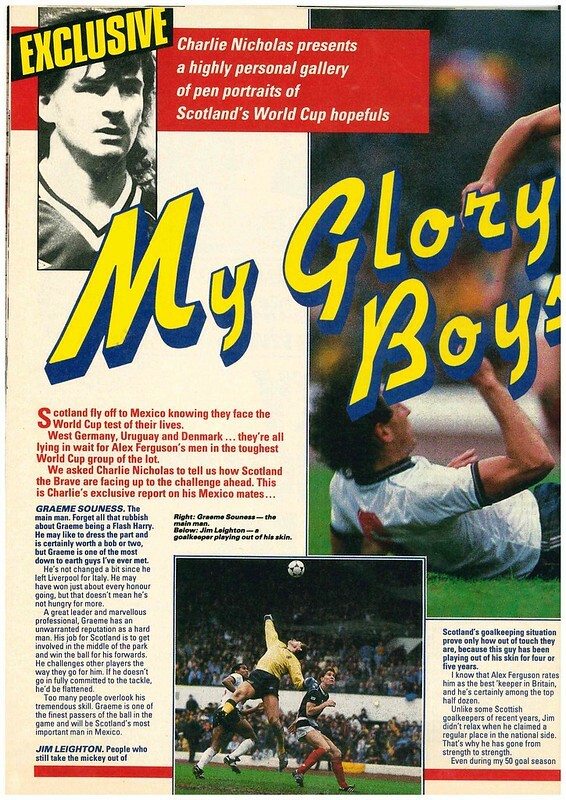 The magazine ends with a double page profile on Paul Gascoigne, as Match assesses his performance against Czechoslovakia in one of England’s warm-up games.